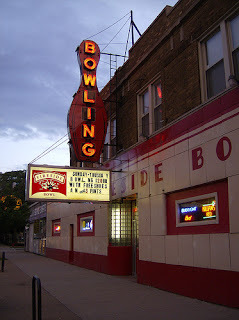 Finally, a chance to acquaint myself with the legendary lanes of the Fireside Bowl. 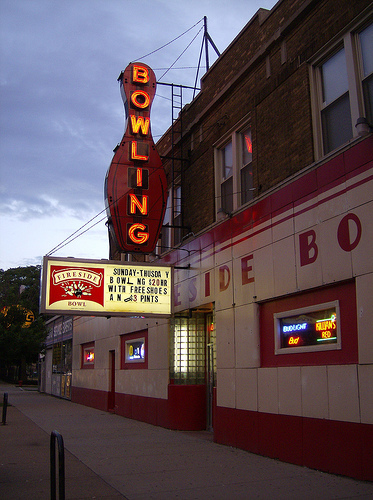 Listening to Allister eulogize the historic Logan Square bowling alley in junior high, I had no idea it was located in the city I grew up in the suburb next to. What better introduction to the Fireside than with a couple of bands that Chicago can claim its own. Verma started off the night with wah-powered jams reminiscent of instrumental Flaming Lips and Spacemen 3. The term psychedelic will be used all too prevalent with this band, hopefully more as a description rather than a pigeonhole. The reverb-laced female vocals allowed the bowling alley to breathe more vertically than horizontally. Driving tempos and hypnotic bass carried the set full steam ahead. Catch them again at the Empty Bottle on November 5th as part of the Giant System showcase. Next up, Shapers: a band that certainly doesn’t allow a music writer any conveniences. The few empty spaces the band embraces collapse unto themselves into chaotic mindbenders. Tempo changes and odd time signatures abound; when the band actually does play in 4/4 time, they do their best to make it sound like anything but. Keyboardist and singer Amelia hits plastic ivory and twists knobs as if defusing a bomb; our lives depend on her precision. The drummer inflects jazz rhythms and dynamics that make it impossible to toe-tap, but rather force the listener to concentrate and figure out how exactly this band manages to stay in time with each other. Check out a video we posted a couple days ago. Headliners the 1900s, hot on the heels of new Parasol Records album Return of the Century (reviewed last week by Frank) play indie rock with just the right amount of pop to not be skeptical about their intentions. In-between song meanderings reveal that this is actually a band playing together, with plenty of inside jokes and occasional awkward small talk. Comparisons to Bell and Sebastian, Stars and the New Pornographers are all apt and the band's equal gender ratio and multiple singers allow them diverse lyrical and musical points of view. But beware: the energy increases exponentially as the set time moves closer to zero. Indie pop complacency was eschewed in favor of a Sister Ray noise jam, as one audience member was quick to shout out. Sound like your kind of show? Catch them again at the Empty Bottle on December 3rd.